UPDATE: The big man wants to get the band back together. In this case, the band consists pretty much of him, Big George Foreman, now 68, but still ready to rumble. He called out martial artist/Russian citizen Steven Seagal and, we wonder, has he heard back? **Note: Fight must occur before May 1st, 2018. Fight must be open to at least 2 fighting styles for wagers to have action. His first comeback came in the late 80s, and he repped fortysomething men as well as could be, when he won a heavyweight championship, 23 years after he’d done it the first time. George Foreman is an American original, a former bad attitude thugmaster who became a perma-grinning grillmaster, and he is still one of the top ten best known boxers on this planet, twenty years after his last professional boxing match. George, 68 years old and still vibrant and out and about, said he wants to glove up one more time. The idea came to him, he told listeners of the Everlast TALKBOX podcast, when he was hearing about this intra-league clash, between pugilist-specialist Floyd Mayweather, and the brash Irishman Conor McGregor, boss of the UFC. Why not me, he wondered. He’d need a foil, a McGregor to his Mayweather. Steven Seagal, who had a solid run onscreen as a Hollywood martial arts leading man in the 90s, came to mind. Foreman has dropped about 35 pounds over the last few months and decided he’d put that fine fitness to use. “I feel better than I did when I was the champ in 1995. I can still fight! It’s because I’m eating and exercising and taking care of myself!” He’d aim for 225-230 pounds if and when he fights Seagal. Seagal can use his legs, aim kicks at him, if he’d like. In a ring or a cage? “No weapons at all…he’s be able to kick,” he said, stating that he didn’t think it was right for Mayweather not to let McGregor use MMA moves. They’d do it in a ring, he told us. 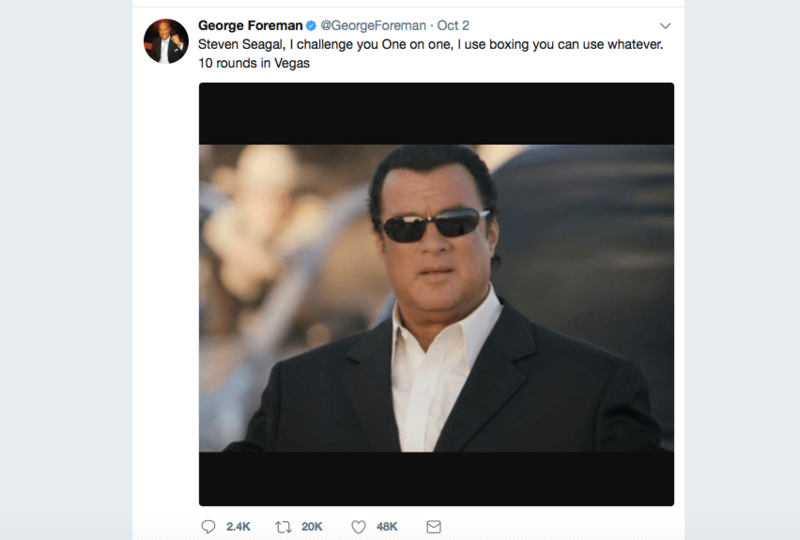 Seagal and company can find George on Twitter and Facebook or they can call Arum, Foreman said. Or, poke me, I will broker this thing. Hey, I think George could still beat some guys in the heavyweight top 50 today, given six months to train. One life to live, we have, if George wants to do it, have at it, big man.